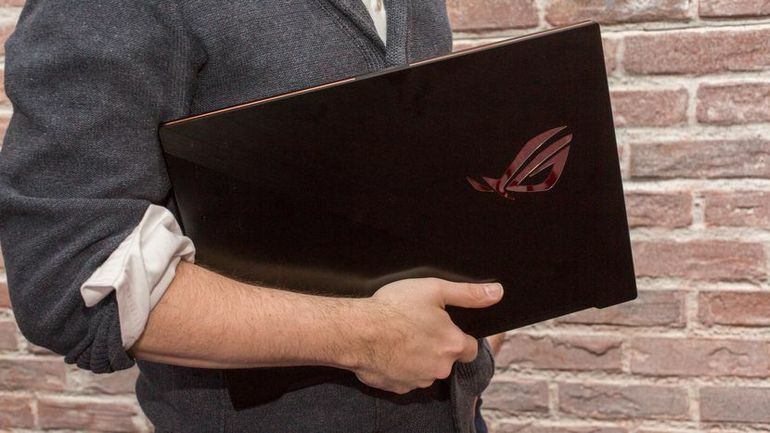 The era of portable PCs for bulky and garish-looking players seems to be over. Henceforth, place to a style assagi, more subtle and to a slimming cure. 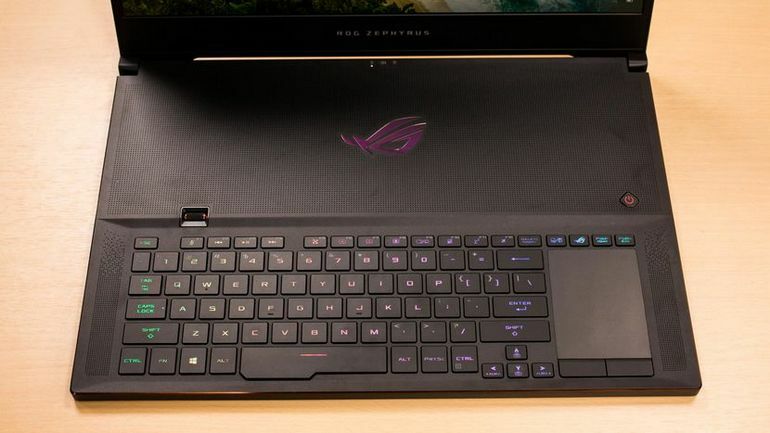 The ROG Zephyrus S GX735 from Asus is the first model responding to this trend that incorporates the new Nvidia RTX cards to enter our laboratory. 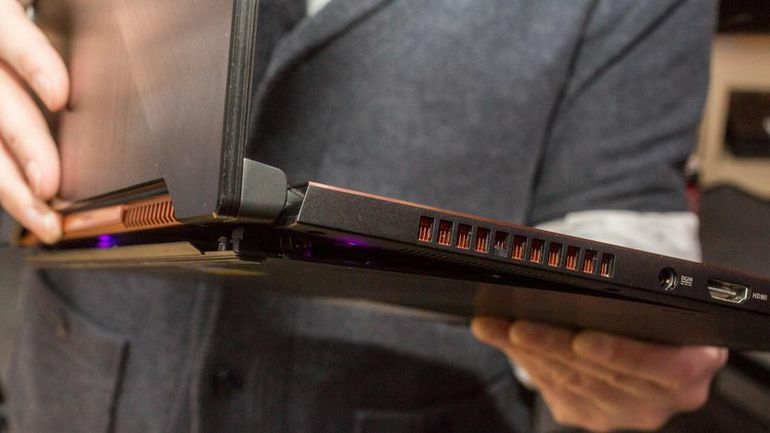 Although it is only 18.7 mm thick, it is equipped with the GeForce RTX 2080 Max-Q, which is in the top of the current range. 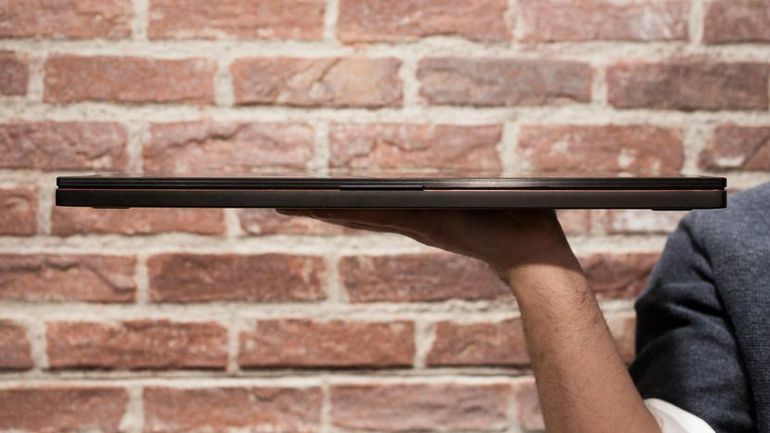 The chassis that incorporates a 17-inch screen measures 360 x 268 mm. More than half of this space is used by the cooling system, which expels heat through side vents. The dissipation is also done by a wide opening at the rear of the system, where the lower panel lifts a few millimeters on tiny hinges when you open the hood. Of course, doing all this space for a high-end graphics card and cooling it involves changes in the usual layout of a laptop. Here, the keyboard grazes the front edge, eliminating the wrist rest. The touchpad is shifted to the right, where we usually find a keypad. Moreover, it is oriented in portrait position and not landscape. In other words, we must get rid of a few decades of muscle memory to adapt to this atypical disposition. Small detail, the touchpad can turn into a keypad at the touch of a button. 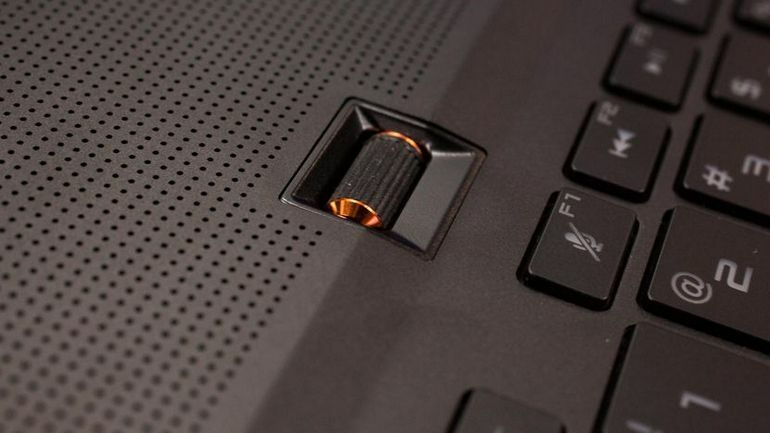 The keyboard, although shallow for a gaming laptop, has a key backlight. But our favorite is the small volume control dial of the system. It's so convenient. The chassis can become hot, both on the panel above the keyboard and on the bottom panel. When the fans are activated, you will probably hear it on the other side of the room. This is the case when you switch the machine to "Turbo" mode via the Asus application to push the settings to the maximum. But there are also "Balanced" and "Silent" modes that are more discreet. In Balanced Mode, the battery has run for 135 minutes, which is acceptable for a gaming laptop, but does not really inspire confidence for car trips or extended sessions without power outlets. Players will usually keep the machine plugged in. But the power of the Zephyrus would also lend itself very well to creative activities with Photoshop, for example, and better autonomy would be welcome. But we were especially curious to know exactly how much a GeForce 2080 RTX Max Q made a difference. Given the still fairly limited opposition to date, the gap is significant. 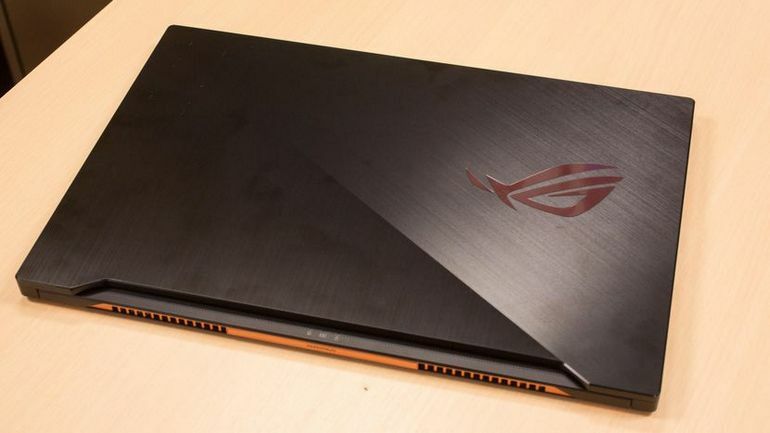 But let us temperate this observation by noting that we have only been testing this Asus laptop for a few days and that we do not yet have several scores of machines equipped with RTX portable to compare. What's so new and different about these graphics cards? Nvidia focuses on several new key features. First, ray tracing that simulates the physical behavior of light to produce more realistic reflections and shadows. Battlefield V and Metro Exodus are the first games to exploit this ability. Then there is the Deep Learning Super-Sampling (DLSS) which uses deep learning algorithms to perform a super-sampling that generates twice as many frames per second as the previous-generation GeForce GTX. Shadow of the Tomb Raider, Darksiders 3 and Anthem are the first DLSS compatible titles. Does it make sense to upgrade to a new RTX laptop if you have a GeForce GTX? Based on our anecdotal use of dozens of gaming laptops over the past year, we would say it depends on your budget and expectations. The GTX 1060 GPU, popular in the entry-level and mid-range configurations, is starting to struggle with the new games in high settings. On the other hand, machines equipped with GTX 1070 and 1080 are still doing very well. For others, there will not be much to decide. As of now, most new gaming laptops will include GeForce RTX Series 20. You will therefore automatically join the RTX club.